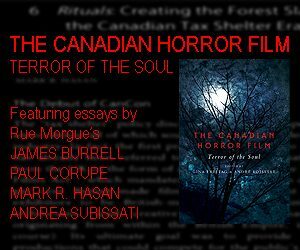 On April 20th, 2016, David Cronenberg’s 1981 head-blowing shocker Scanners was screened at Toronto’s Royal Cinema as part of Reel Canada’s National Canadian Film Day. 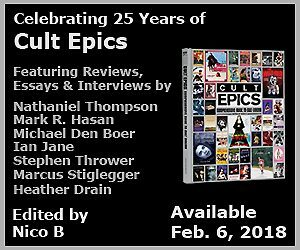 I profiled the event in a specific April 22 Editor’s Blog and there’s already an iTunes and Libsyn podcast that features my additional comments bookending an edited version of the post-screening Q&A with actor / artist Stephen Lack and NOW Magazine’s Norman Wilner. The basic workflow involved sending the final audio edit of the podcast into a Thurlby OM358 Oscilloscope Multiplexer, routed into a Hung Chang OS-620 Oscilloscope, and sending the images as captured by a Sony miniDV camera via firewire into Adobe Premiere, where colours were refined, and for the Outro section, material was layered. I won’t get into the precise settings because what you see involved live playback and sticking with a series of specific sweep timing settings and magnification on the oscope, using the multiplexer to both display multiple tracks on one screen and finding the right sweet spot using the Thurlby’s Fast-Slow Multiplexing knob. 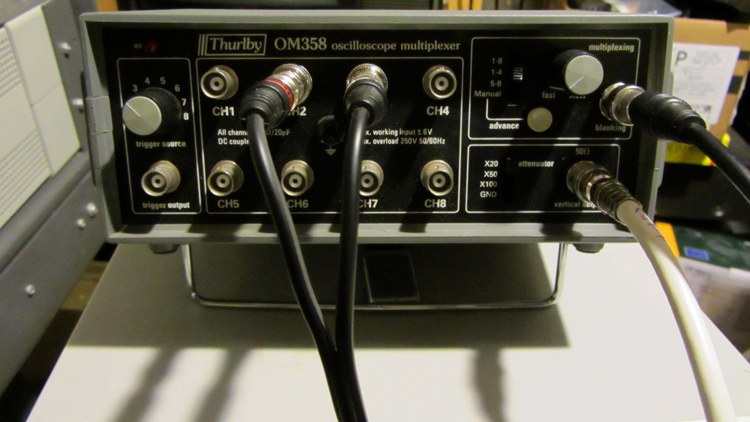 A Thurlby OM358 Oscilloscope Multiplexer. Stereo audio went into the Thurlby (which can accept and output as many as 8 tracks), and then into the oscope’s X, Y, and rear Z inputs. 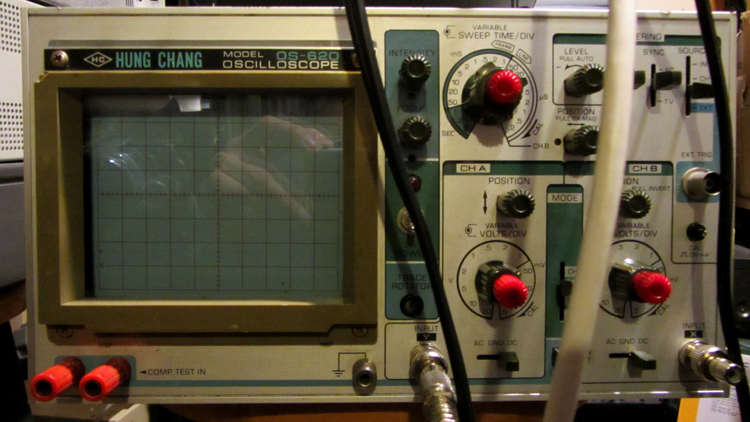 A Hung Chang OS-620 Oscilloscope. A little tweak here and you get tin lines; a tweak there and they become raster dots, or pulsing blobs or any number of other combinations. Basically, the images recorded to camera were done by finding the most appropriate settings after maybe 2 hours of fiddling so that the pulsing lines looked right, were framed right, and had the right brightness to hide the oscope’s permanent screen graticule (grid pattern) and get clean lines before being captured in Adobe Premiere. First rendering the blog’s Intro + Outro and central Q&A sections as separate higher bit rate files and later final 720p podcast assembly took around a day, and while this sounds like a tedious endeavour, it was a lot of fun to create, and I highly recommend spitting the podcast and / or the HD extracts onto a big monitor, and maybe on a large wall for projection. I should warn that the images flicker, so viewer discretion is advised. Those wanting to be tripped out by the intersecting green lines in the final (Outro) extract should sit back and relax the eyes, as the lines expand outward in measured waves. The intended effect is for the lines to form fleeting grids and geometric shapes while my voice makes the sharp ends pulse. And yes, I do custom work.